This is my matching garland. It stays with the natural theme of our tree. On top the mantel my nativity. Here is what the tree looks like at night. Pictures really do no favors for Christmas trees. I have to squish it all in when I can. What a beautiful tree!Wow, now I know why you put your tree up early! You are so busy. Have a blessed day! I completely understand why you decorate a little bit early. I think decorating early is fine...enjoy all the beauty and hard work as long as you can...plus it's just a small reminder to remember the reason for the season as we see all those sparkly lights and Christmas scenes..I am slowly starting myself. I was wondering why you had your tree up so early but it makes complete sense, if you didn't do it now then you'd never have time to get it done with your busy upcoming schedule. Your decorations are gorgeous, I love love LOVE the natural nature theme and have been wanting to do something very similar. Thanks for the beautiful inspiration. Have a wonderfully blessed week! Well it's absolutely perfect. 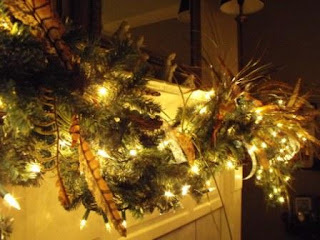 The tree and the mantel are beautiful -I love the feathers. "Gorgeous" describes all of your Christmas decorating. Very pretty Susie! I love your tree and your mantel! Looks beautitful. Love the natural theme. All I can say is WOW!!! It is beautiful. You go girl! Hi Susie! I love it, wish I could see it in person, and I wish I could come to some of your shows...I bet they are incredibly fun. It's true you have to fit things in according to your schedule. To me once December hits, we are on a dead run with activities, church, family, meals, etc....I'm worn out already! Hahaha, but I love it. 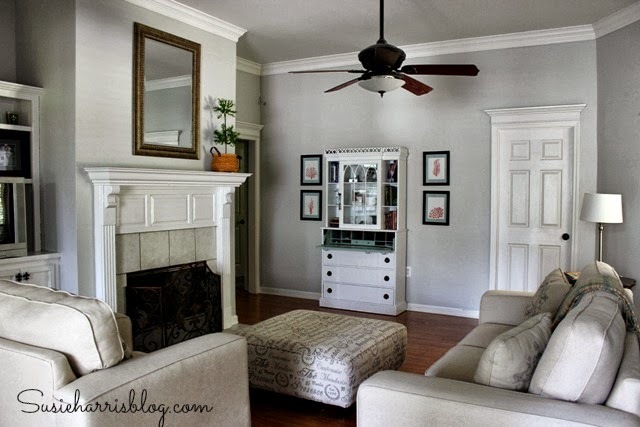 Love your beautiful mantel! Beautiful!!! Can't wait to see what else you do! LOVE the garland on the mantle!! 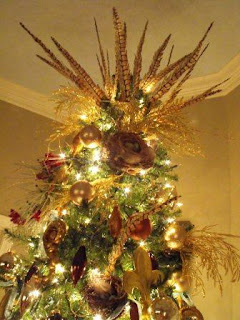 I have a tree with pheasant feathers and one with bird nests, but I wouldn't have thought to put them together -- It looks fabulous! Everything is so lovely! I just love the feathers and the nest! I've been fighting the urge to start putting up my Christmas decorations this week--this makes me want to dig all my stuff out! Everything looks great. I start early too. The tree goes up before Thanksgiving and we decorate it the day after. I LOVE your BEAUTIFUL decorations, if I wasn't having Thanksgiving at my house, I would be so inspired as to decorate after looking at yours... Thank you for sharing your home. Sue, What a beautiful tree. I know what you mean, you have to try and get in a little decorating for the Holidays while you have some time. I know I do. 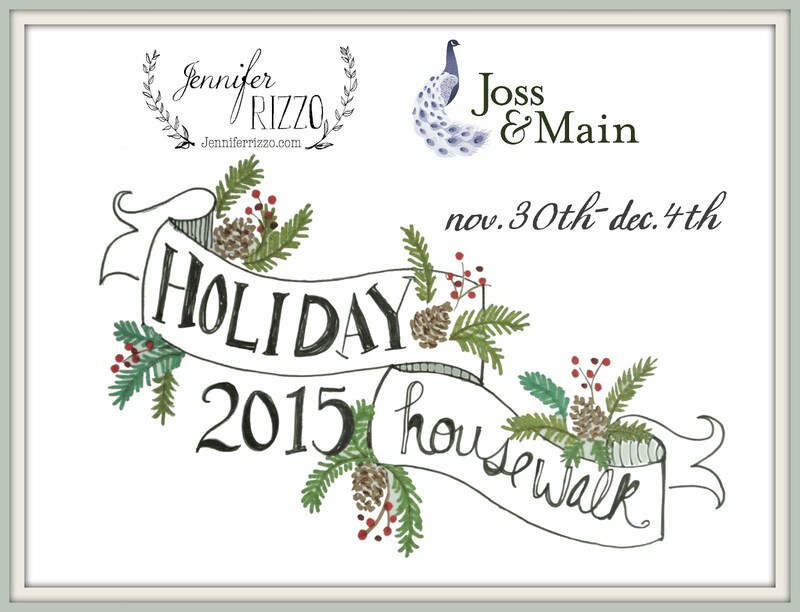 I'll be posting my decorations this week...come take a peek. I don't decorate until at least after Thanksgiving. Sometimes I wait until after my birthday in early Dec. It's gorgeous, Susie. 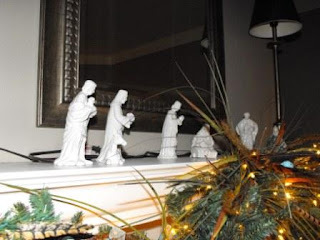 How do you hang the garland on the mantle? If you use nails, aren't you afraid of big gaping holes? Mine's gonna be chuck full of stuff this year, so I need to hang it like yours. Nicely done! By having it all done so early only means you get to enjoy it longer. Christmas seems to come and go so quickly, so let's celebrate this season as long as we can. Hi Susie, It always brightens my day to get a comment from you! I know you are so busy so it means even more to me. I have started decorating too. My husband put the outdoor lights all up last weekend but we have not turned them on yet. We have a granddaughter (Noel Grace) coming into the world right around Christmas so I thought I'd get a early start on things too! Your tree and decor are amazing! I'm sure photos don't do it justice but if it's better in real life it would be unreal to me! It looks like it should be displayed in some fancy schmancy store! Just beautiful. Where do you put your stockings? 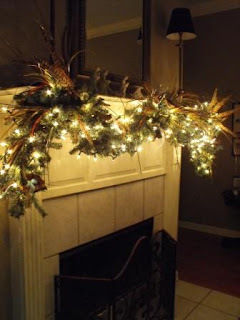 I love your mantle garland So pretty! And I agree, it's hard to take a great picture of a lit up tree, it's always more beautiful in person! 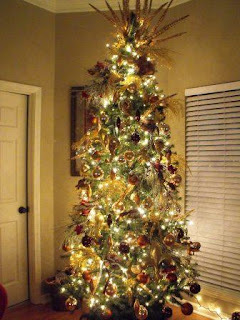 Your tree and garland are GORGEOUS!! Your decorations always look so elegant!!! 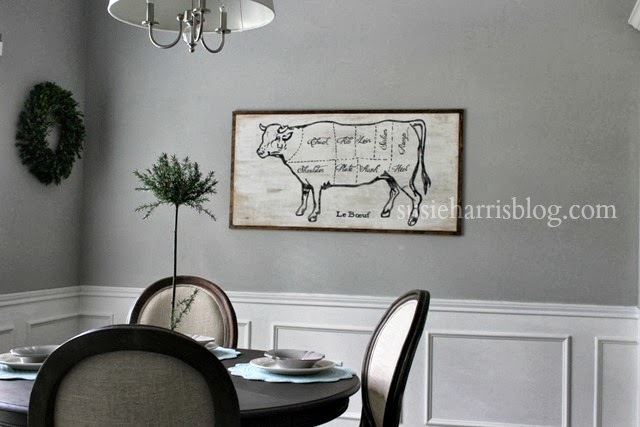 I am going to start decorating this weekend....I am excited!!! We seem to get slammed in December too with the go, go, go situation. Lexi is in a couple of performing groups (Show Choir and Jump - n - Jive which is a perfoming/stunt jump rope team) and always has many functions in December. 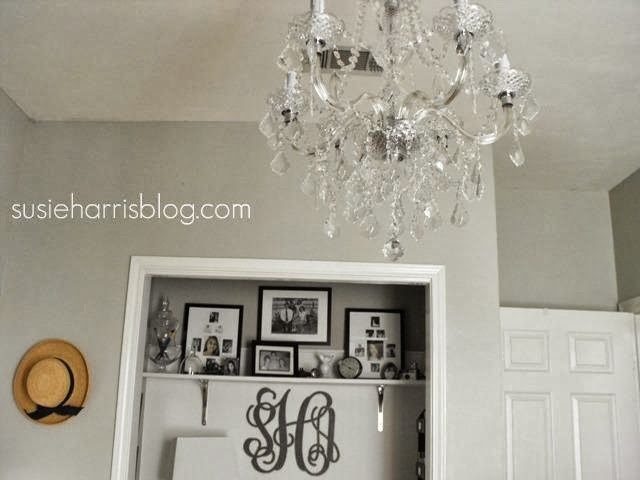 I love that garland on the mantel! You have a beautiful set up! I ALWAYS enjoy your pictures...they are beautiful! feathers...how did i know!? so fun and fancy and beautiful. i love it! Everything is so pretty! I use feathers on my tree as well. I would love to see your tree during the daytime so that I can see your decorations on the tree better. Hint Hint! Love it! But I'm still not ready to get out the Christmas stuff until December 1. Ooohhhh! I am in heaven. Your garland and tree are spectacular, stunning, gorgeous...the list could go on and on. And, p.s....I love to decorate early for any holiday! You get to enjoy it for longer. Yep, fluffing my tree to tonight! Your decorations really do look amazing. Now, if I could just get my husband on that stinking ladder so I could REALLY start decorating tomorrow, I'd be pleased as punch! Love your feathers!! 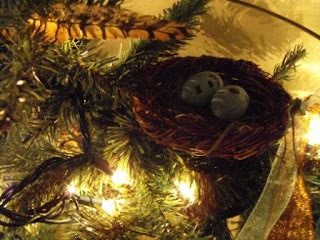 I have feathers too in my tree and mantle that I have had the hunters in my life collect for me. I posted some pictures but I think I need your photography ability.. I think I'll try again! Love all your decorations, Susieness! Your mantle is perfect. I always have a little trouble doing my mantle. Your tree is gorgeous! I love the froo froo of those feathers. Good for you, now you maybe can enjoy it a bit. I love the feathers! It is beautiful! Beautiful Christmas decorations. I love all the natural colors. I think the pictures you took turned out great of your Christmas stuff. It really stands out! It's all very beautiful! I'm itching to pull out the Christmas decorations but I promised myself that I would enjoy the seasons and holidays without rushing them. Who makes such promises to themselves?! UGH ~ only 9 more days! 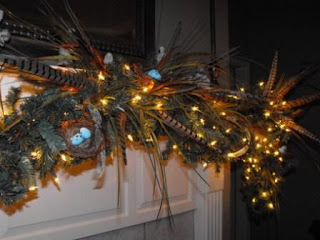 How do you attach the garland to your mantel? I have always just laid mine on top? Beautiful! Thanks! We had piano practice today and Kiddo's teacher already had her tree up, too! Yours looks like it belongs in a fancy-dancy department store! It's beautiful! WOW! Your tree and mantel are so gorgeous!! If my decor looked like that I'd put it up this early too! Wow! 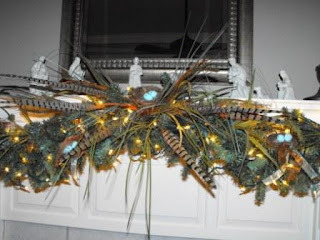 It all looks beautiful...Love the feathers, I use a lot of them at Christmas too. Can't wait to see what else you are doing! I am decorating for Christmas too just because I cant wait for Thanksgiving!!! hehe The tree and mantle look beautiful all lit up! I love the theme you chose this year, its just stunning!! You did such a great job! Everything is just gorgeous. I love Christmas. It's my favorite time of the year. The only thing is it's still currently in the 90's here in Los Angeles, UGH! Hello. I got my Noel at the "Dollar Tree...Everything is a Dollar" store. I'm back with another question...how do you get it to STAY up there? Duct tape? Super glue? I'm always afraid that one.more.thing. will make my whole garland - crash! Also - are you doing any shows anywhere near Columbus. MS? I have a dear friend who recently moved there from UT and is feeling like... well, a "northern girl" in a very "southern girl" town. 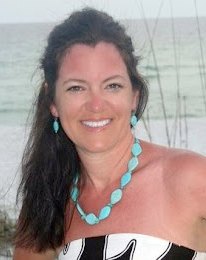 I would love to let her know about something fun to go and do! I am so impressed by both your decorations and your ability to get them up so early. Of course, if I had such wonderful ideas I would want to look at them as long as possible, too. Gorgeous! I love the lights at night, its so cozy !! you did a beautiful Job!! I tend to put my tree up early, too. We put it up last week this year...since ds#1 had 2 days off of school and for some strange reason we already have snow on the ground here in SE MI this year...too early!!! You are right that cameras do not do Christmas trees any justice, strange isn't it? 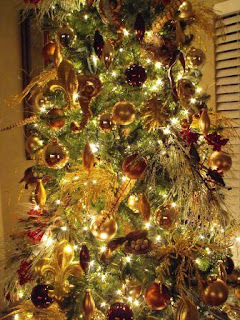 The tree and garland are so rich looking and beautiful! I'm jealous! 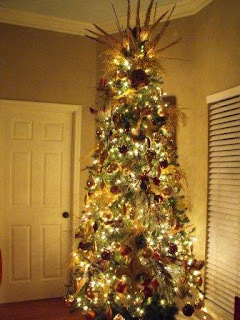 OH my..I love that tree..I am not a big feather person but I love that!!! Love it!! Just beautiful!! Wow, I am so inspired to get started on the decorating tomorrow!! I know the pictures don't do the tree justice, but it looks amazing! hey Suzie, just thought I would let you know that your header says that you are a stay at home. I know you meant to say that you are a stay at home mom...just thought I would let you know in case you missed that. Love your blog! Beautiful!! Wishing you loads of success during the upcoming shopping season!! Good grief! I totally didn't remember that Broadmoor was this weekend....ugh. I am going to miss you because I can't GO! I already have things I have to attend this weekend so I won't be there. I hate that. It's so close too. I would have loved to go and support you. Well...we will try again another time my friend. I'm hoping you do WELL there. I will be thinking of you though. P.S....loved your decorating. We will be hitting it this coming weekend. Whew! You know I work with the sesaonal things every day and have since about September. HA! So I really don't miss it at home but the kids do. Your tree is absolutely beautiful!